Milky Way and Andromeda to merge | Climate S.W.A.G. Our Sun’s position will be disturbed but the star and its planets are in little danger of being destroyed. I suppose that is true….but in 4 billion years the sun will be a red giant, Mercury and Venus will have been consumed by the Sun and the Earth will be so close to the Sun that it will have no atmosphere and be unbearably hot. But it won’t be damaged by the galaxy collision. Go Earth. 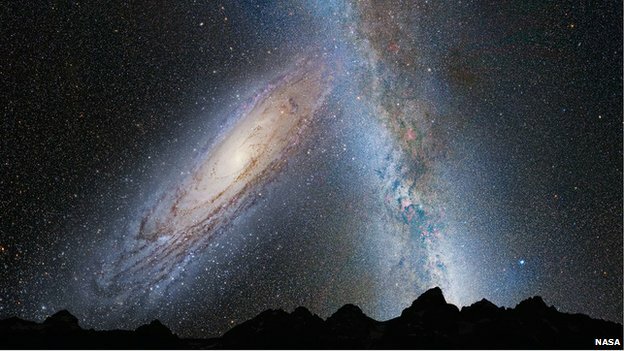 This entry was posted in Science and tagged Andromeda, climate, galaxy collision, Milky Way, science. Bookmark the permalink. I feel like speculative science like this uses all the wrong verbs. Instead of talking about what we expect to happen or what may or might happen, it’s what WILL happen. That kind of confidence about something that may happen four billion years after we’re gone cracks me up. I agree, and I was a bit cavalier with my use of language too. What we supposedly know scientifically changes. Just a few years ago the universe was slowing down it’s expansion, now it’s speeding up…go figure.